The Hill of Crosses is a small hillock about 12 km north of the city of Šiauliai, in northern Lithuania, where several thousand crosses have been placed as a tribute/memorial to Lithuanian national identity. Most recently, the site took on a special significance during the years 1944-1990, when Lithuania was occupied by the Soviet Union. Continuing to travel to the Hill and leave their tributes, Lithuanians used it to demonstrate their allegiance to their original identity, religion and heritage. It was a venue of peaceful resistance, although the Soviets worked hard to remove new crosses, and bulldozed the site at least three times. On September 7, 1993, Pope John Paul II visited the Hill of Crosses, declaring it a place for hope, peace, love and sacrifice. 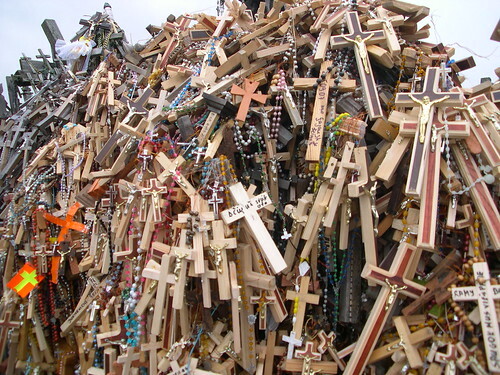 Reportedly there are more than 50,000 crosses of varied size - from three meters tall to the countless tiny ones hanging profusely upon the larger crosses, and variety - ranging from beautifully wood carved to metallic. Many people see this place as a Roman Catholic site of pilgrimage but in my opinion it is a site symbolising the Gandhian philosophy of passive resistance. Credits: I am thankful to Umme-Ayaan for suggesting this site.